The consistency of grip between tyres and the road surface is critical to motorcycle stability, particularly when leaning over for cornering, braking or accelerating. Most braking effort and all steering control for a motorcycle is through the front tyre which means that riders try to avoid combining braking and steering in order to reduce the likelihood of overwhelming front tyre grip as it deals with conflicting forces. Any change in this grip, and particularly a sudden decrease, can lead to loss of control during the manoeuvre as the front wheel slides away. Loss of front tyre grip on a bend almost invariably leads to a crash. All accelerating force is through the small patch of the rear tyre in contact with the road. A sudden reduction in grip (eg because of a surface change midway through a bend) can result in the rear tyre slipping sideways and in loss of control. Motorcyclists adopt a different line through bends than drivers of twin-track vehicles, traversing the width of the lane in order to maximise grip through minimising steering inputs. This keeps the machine as upright as possible and maximises forward visibility and safety. Anything that forces riders to choose a less than optimum riding line through a bend increases the risk of loss of control. Motorcycles have a much greater need for a consistent and high coefficient of friction from the road surface than twin-track vehicles, especially on wet surfaces and in areas requiring braking and steering. Riders adopt an angle of lean to negotiate a corner that is related to speed and bend radius; any change in grip between tyres and surface can destabilise the machine. Any deviation from a consistently level surface in the same areas can seriously impair the motorcycle’s ‘road holding’ ability. A sudden change in surface level or evenness rapidly loads and unloads the suspension, which reduces the grip between front wheel and road surface. In other words, the wheel rebounds upwards and in severe cases can lose contact with the surface. Unpredictable changes in the road environment that call for rapid deceleration or braking while cornering can cause the motorcycle to ‘sit up’ and take a tangential line away from the bend. Consider opting for posts made from flexible materials (see image below). The Council implemented a site-specific engineering solution on one particular bend where there had been three motorcyclist fatalities in five years and a number of serious injuries including car drivers. The principle behind the scheme, now recognised by the Highways Agency, is called “where you look is where you go” (WYLIWYG) and works on the basis that if you can ‘hold’ the rider’s/driver’s eye around a bend then they are likely to successfully negotiate it. Filming of this and similar bends had indicated that incorrectly placed chevron signs could misrepresent the radius of the bend, especially at night. Hazard marker posts were positioned on the outer edge of the bend to focus the rider’s eyes on the ‘vanishing point’. For this to be effective, it is advisable that posts should be spaced no more than 5-7 metres apart. The owner of adjacent land also removed bramble overgrowth to maximise visibility across the inside of the bend. This low cost measure appears to have been successful, with no injury collisions more than two years after completion. The predictability of bends is also important. Curves and bends are often popular among motorcyclists because of the technique challenges they present, the scenery with which they are often associated and their contribution to the riding experience. However, due to braking difficulties, unpredictable curvature and road grip represents a higher risk to motorcyclists than other motorists. Conversely, predictability benefits all. The crossfall on bends can present challenges for motorcyclists due to the reduction in contact between the tyre and road surface, particularly in wet conditions. It is therefore also wise to optimize crossfall and longitudinal surface consistency. The Department for Transport has issued guidance on reducing street clutter in Traffic Advisory Leaflet 1/13 ‘Reducing Sign Clutter’. This aims to maximise safety, improve the appearance of towns and assist mobility and visually impaired people. Limiting the number of roadside objects with which a motorcyclist who leaves the carriageway can collide, reduces the likelihood of injury. Drivers often do not ‘see’ motorcyclists because of the relatively small frontal area presented by their machines, the presence of other road vehicles and roadside obstructions. Well-designed and maintained visibility splays at junctions are required so that drivers do not have their sight lines obscured. Potentially higher speed on rural roads, especially those that are attractive to leisure riders, means that much of this Chapter has significant importance for casualty reduction on rural roads. Traditional designs of roadside safety barriers have received considerable criticism from rider groups and road safety auditors because of the specific risk of injury to motorcycle riders in a collision. Crash barriers have usually been designed to contain an impacting twin-track vehicle and prevent it crossing the path of oncoming traffic. However, the gap beneath the main panel of continuous barrier designs can allow motorcyclists to slide through and collide with the fixing posts. Although motorcyclists contribute only 1.1% of traffic, they account for 18.6% of fatal safety barrier casualties (Safety Barriers and Motorcyclists Transport for Scotland 2008). Further, impacts with barrier support posts have been estimated to cause a five-fold increase in injury severity compared to the average PTW crash (Barriers for Change, EuroRAP, 2008). Very severe and fatal injuries to motorcycle riders from these impacts are a particular issue in rural areas or on motorways where these barriers are common. Similarly, wire rope type barriers, whilst providing a relatively low cost and effective method of containing vehicles, present potential additional hazards to sliding motorcyclists. 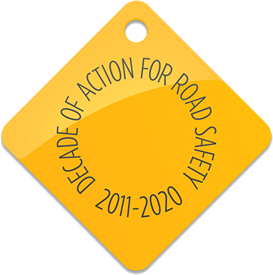 In 2012, FEMA published the document “New Standards for Road Restraint Systems for Motorcyclists”. This provides information on possible solutions for road authorities and infrastructure operators who wish to upgrade road restraint systems and presents the current technical standards, statistical data and research, best practice and case studies. It also lists and details many road restraint products available on the market. At priority junctions and roundabouts it is important to optimise sight lines and to provide good braking surfaces for all users. This will mitigate the risk of drivers not responding to motorcyclists’ presence even when the latter have priority. The relatively small frontal aspect of motorcycles makes this particularly important because they are more difficult for drivers emerging from side roads to identify. Where roads approach priority junctions at a shallow angle, car drivers are required to look over their shoulder to check for any oncoming vehicles. A driver’s view can be obscured by the central door pillar, making it more likely they will fail to see approaching motorcyclists. Side roads approaching priority junctions as close as possible to 900 helps to reduce vehicle speeds and improve the visibility of motorcycles on the main road. Wide entries to priority junctions can encourage drivers to pull up on the offside of the rider, especially if the latter is on a low powered machine. Excessive width of the entry can also encourage two cars to pull up side by side, obscuring the adjacent driver’s view of oncoming traffic on the main road. Roundabouts should be designed with the correct entry path curvature to ensure that approaching vehicles are not positioned at an excessively oblique angle and to help reduce the speed of vehicles approaching the roundabout. A balance will need to be struck between capacity and safety. Concentric overrun areas often feature on roundabouts to increase the deflection around the roundabout, reduce speeds and make more conspicuous to approaching vehicles. Care needs to be taken with this kind of treatment to ensure that it does not introduce an additional hazard for circulating motorcyclists. Some overrun areas have been implemented with a slight kerb up-stand (c. 10-20mm) between the ‘extended’ area and the remaining carriageway. As a motorcycle must lean to negotiate a roundabout, crossing the up-stand can cause a rider to lose control. Similarly, a substantial variation in the skidding resistance between two different types of material can also cause loss of control. Thermoplastic road markings and some types of block paving can be a particular problem for motorcyclists in these situations. A more acceptable alternative would be the use of a high quality, cold-applied, coloured antiskid material which provides the required visual effect without presenting a hazard for motorcyclists. The positioning of street furniture and vegetation outside visibility splays is critical for safety at junctions. A significant proportion of collisions between motorcycles and cars in urban areas are caused by emerging drivers failing to see the oncoming motorcycle. Higher traffic speeds on rural roads make consideration of sight lines particularly crucial. The rails of on-street Light Rapid Transit (LRT) systems can have a destabilising effect for motorcyclists and cyclists. This equally applies to rails at traditional level crossings, particularly where the carriageway crosses the railway at an angle. When considering potential or existing schemes, seek out the experience of other LRT projects such as Manchester, Sheffield, West Midlands, Nottingham, Edinburgh and Croydon. Consistent horizontal alignment (eg avoiding bends that tighten after entry). This minimises the need for change of steering angle and angle of lean and thereby mitigates critical risks where the road surface is compromised by water, detritus or leaves. 3.6 deals with vertical and horizontal alignment within the context of traffic calming. Chapter 8 considers this issue within Road Safety Audits. Cross-sectional design consistent with the speed of the road and the radius of the bends. This is more of a problem for roads that have ‘evolved’ over time, rather than new-build. Adverse camber or inadequate super-elevation can be a problem for all motor vehicles but has graver consequences for motorcyclists. Motorcyclists should be able to brake and stop while upright, travelling in a straight line and on a surface which offers consistent grip. Clear and adequate sight-lines to pedestrian crossings minimises ‘last minute’ reactive behaviour. Formal crossing facilities should not therefore be positioned by bends. Consistent skid resistance including that of extra surface features such as coloured patches. This is especially important on bends, given the rider’s need to vary position across the lane to maximise safety and provide maximum forward visibility. High friction surfacing at junctions with a history of drivers emerging against priority into the path of motorcyclists. This maximises the rider’s chances of braking safely. High friction surfacing should terminate on straight sections. Sudden changes in road surface properties on bends and at junctions, especially skid resistance, can lead to stability problems as the rider manages the sudden change in the dynamics and response of the motorcycle. Avoidance of different surface materials, for example granite setts, to emphasise a change in circumstances at turning points. This can destabilise motorcyclists at priority junctions and small roundabouts. Thermoplastic markings rarely have the same skid resistance properties as the surrounding road and their skid resistance deteriorates faster than the road surfacing. These are particularly hazardous to motorcycles in the wet. Arrows and destination markings on bends or roundabouts cause concern to riders as the motorcycle may be leaning over, accelerating or braking. 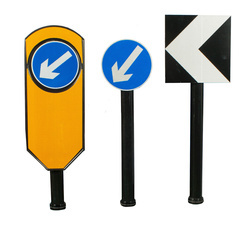 Clear advance warning and direction signs should minimise the need for such surface signing. Careful thought should be given before using large areas of hatching. Specifications for and positioning of inroad and roadside furniture, including impact characteristics when struck by a fallen or sliding body. It is crucial to minimise the number of obstacles, especially on higher speed bends, and to use supports that do not shear off leaving sharp remains or that have protrusions that could snag a fallen rider. On higher speed roads consideration must also be given to the ‘swept path’ of the rider leaning into bends, even though this is not of concern for twin-track vehicles. Smooth transitions in vertical alignment to minimise loss of tyre adhesion and to prevent water collection. This has a greater effect on motorcycles than on twin-track vehicles. This is a critical factor when positioning street furniture or planting, especially at junctions. Consider the full growth of trees and shrubs and leaf fall characteristics and maintenance. Where it is absolutely necessary to use kerbs in rural areas, use battered kerbing to minimise potential injury to a sliding rider. When redesigning an existing layout consider the position and level of utility covers, especially on bends and within braking or steering areas. Avoid forcing riders to overrun them whenever possible. If it is unavoidable, use covers with an “in service” skid resistance similar to the surrounding road surface. Consistent signage along a route meets riders’ expectations. This links to the concept of ‘self-explaining roads’. This is where the level of signage and marking is proportionate to the severity of the hazard and the approach is consistent along the whole route. If the road can ‘deceive’ then warnings are required. This is particularly the case for a tightening radius or horizontal deviation immediately over a crest. The concept is already used for the highest road classes (motorways) but on lower class roads consistency in design can often be compromised by other objectives such as high access levels, variable alignment, mixed use and variable roadside development. Identify areas where high friction surfaces are required (e.g. bends and junctions) and remember the friction levels of new asphalt surfaces. The levels of friction in newly-laid asphalt surfaces are hindered by the presence of bitumen. Low friction levels can lead to loss of traction for motorcycles. Over time, vehicles passing over the surface naturally remove the bitumen and the friction levels rise. However, this timeframe may not be acceptable on roads with low volume traffic and locations where high friction is essential (i.e. junctions and bends). Avoid including design features that require higher levels of maintenance than the road is going to receive in reality as this could lead to future safety problems. An example of this is high friction surfacing which has often been applied to address sites with a history of loss of control collisions. However, if it is not suitably maintained then the effects on motorcycle stability and grip can be more serious than before the intervention.